The male lion (Panthera leo) is an iconic figure representing power, strength and regal bearing. Considered “The King” of the animal kingdom, the lion's strong face and unique mane are among the most recognized symbols in human history. With some males exceeding 550 pounds, the lion is the second largest living cat. They live for ten to fourteen years in the wild, however, the males seldom live longer than ten years, due to injuries sustained from continual fighting with rival males. Although the adult male's heavy and conspicuous mane is a sign of virility and acts as an intimidation display, it can also be a burden, tending to cause overheating during exertion, which is partly why the male lion does not usually bring down prey alone. Instead, they prefer to allow the majority of the hunting to be done by the females and the pride. 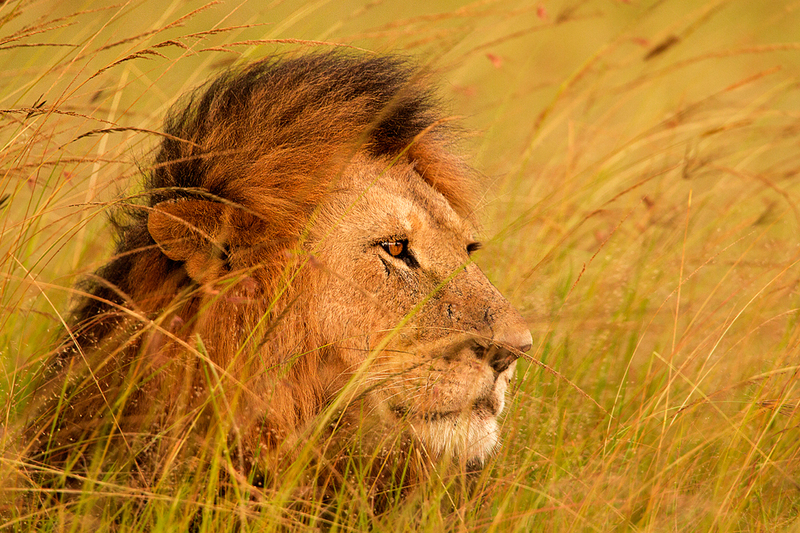 In this portrait taken in Kenya, a large male African lion spends a warm afternoon stealthily watching a nearby grazing Impala, while tucked in among the tall grasses of the Serengeti (meaning, “Endless Plains”) grasslands.